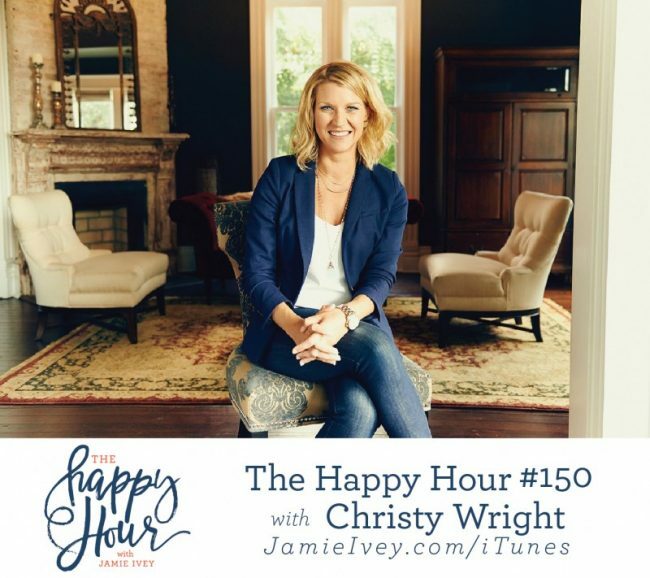 My guest for The Happy Hour #150 is Christy Wright. Christy is both entertaining and inspiring, and presents messages that educate and give hope to audiences all over the country. As the creator of Business Boutique and through her podcast and sellout live events, Christy has equipped thousands of women to successfully run and grow a business so they can make money doing what they love. Since joining Ramsey Solutions in 2009, she has spoken to audiences across the country at women’s conferences, national business conferences and Fortune 500 companies. Her new book, Business Boutique, released April 2017. Y'all, I so loved my conversation with Christy. I get so many emails from women all over the country with dreams - some of them new and exciting ideas, and some of them have been growing and evolving for years. If that's you, I just feel so confident that this conversation is going to help you to feel more confident making the next step towards that dream. Christy is so inspiring and such a cheerleader for women following their passions and working within their gift sets. She does such a great job of helping to reframe moments of failure to being an event, rather than an identity. And she helps to combat some of the most common fears and lies that keep women from taking steps towards their dreams.